News from the farm in Diggers Valley, for the week beginning 23 November 2002. The weather was fine and we couldn't really put it off any longer... we finally got the calves in and ear-tagged, vaccinated and castrated. The oldest calf is two and a half months old, so some of the boys took quite an effort to restrain while the rubber ring went on. One day we'll build something efficient to hold the calves while we do things to them, but currently one of us holds the calf against the railings and the other performs the task of the day. Now I can tell who's who out in the field, which is always the fun part, since in a mob of calves, any individual is hard to follow. Now I can look for #406 and know that he belongs to #92 and is the son of Lendrich, the bull. 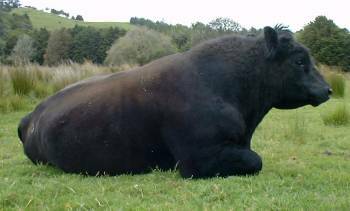 I have yet to follow them with my 'sire list' and see which calves are half-siblings by sire and what similarities there are amongst them. As often happens when we're just getting on with the job, I didn't take the camera with me, so no pictures of the process. 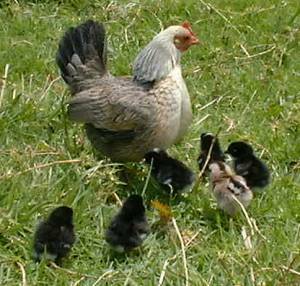 The bantam hens are very difficult to keep caged for even a short time to train them to do their egg-laying in boxes, inside the hen-house. So they're all over the place and obviously return to the enclosure to visit the rooster and then go back out to lay their eggs in their secret nests. When one or two of them disappear for long periods, we don't really notice, but then, after a while, they appear again, with additions. 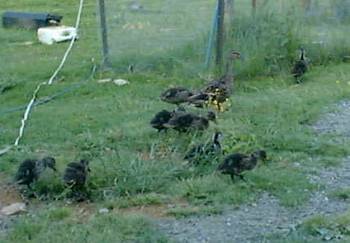 I managed to 'off-load' a newly hatched batch when I went to Auckland, so they now live with some delighted children, who's mother I 'met' through the LifeStyleBlock discussion forum. Time to bring the 'young mob' (with a few extras, like bereaved mother #14 in the foreground) in to the yards, on their way to the grass across the road. It is also time for pairs like this to be weaned! This is Onix and Sapphire (nephew Issa's animals). Sapphire is eight months old and it's time for her to begin an independent life. There are four others in the mob who will be subjected to the same treatment. 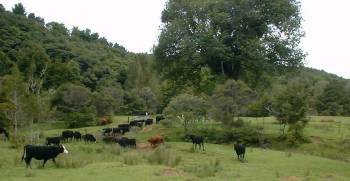 Stephan was busy building the fence which forms one side of the lane beside our house-paddock, so things became a bit tricky at that point, but with a bit of running about, we urged the cattle on and he went back to fencing again. The cattle and I went on to the yards and everyone was weighed, the autumn-born calves were finally weaned and they and their mothers spent the rest of the day calling to each other through the fence. Sitting here this evening, working on this site and past my window wandered ... Oh no! Yet more fluffy children. These are nothing to do with us, except that they've obviously already discovered that there's a good source of food around here. 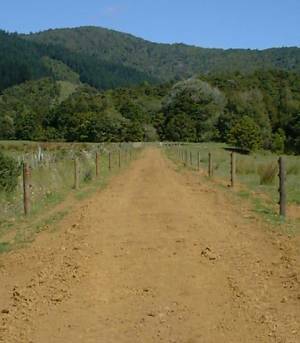 Here's my beautiful new lane, for cows and sheep to tidily walk along, between paddocks and yards. The lane, in various states of repair, has been used for some years, but cows could climb down into the drain if they were left waiting, which is not good for the drains, even though the cows like what they find to eat therein. 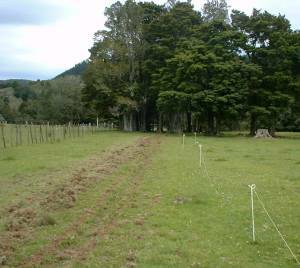 Over the last couple of years, the fence between the lane and the paddock on the left, had become seriously challenged! 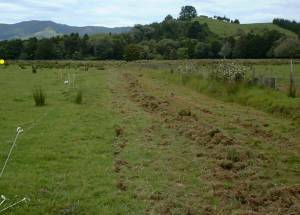 It was only a three-wire fence, but after it had been driven into by an uninvited guest on one dark night and had the occasional post clipped by fertilizer trucks, it was proving rather less stock-proof than necessary. The two young bulls, in particular, as well as some of the calves, were a real trial to move, since they'd just walk through the loose wires and help themselves to the grass in the paddock and refuse to move on to the location planned for them. The gates and some railings have yet to be completed, but Stephan's moved on to the next paddock to do the fencing of the lane there, before coming back down through both lanes finishing off the "details" in both. The yellow dot at the left of this picture shows the location of the lane in the picture above. When I was a child, my sister and I had plastic farm animals in our play-box. For some reason, I always particularly liked the lying-down cow. I think she just didn't fall over as often as the others.